Let’s start out with a trick question: When is a geranium not a geranium? Answer: Most of the time! By this, we mean that most of the flowering annuals you will find at your local garden center that are labeled “geranium” are not really members of the plant genus “Geranium” at all, but rather of the genus “Pelargonium”. Members of the true Geranium genus have blooms that more resemble daisies than the denser bushier blooms of the Pelargoniums. The requirements for growing these plants in your summer flower garden are minimal. The most needed element for producing ongoing blooms throughout the season is direct sunlight—at least 6 or more hours daily. The plants will survive in partial shade, but you won’t get a profusion of blossoms if your plants don’t receive a profusion of sunlight! 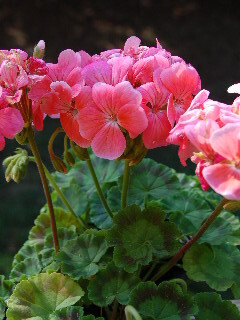 Geraniums are undemanding of soil types—as long as the planting bed is reasonably loose and fertile (not sticky clay), the geraniums will thrive with adequate watering and occasional feedings of balanced plant food. The easiest way to get started with geraniums is to buy the plants already growing and usually in bloom at your local garden center in the late spring. Add them to your garden (after all danger of frost has past) or grow them in containers on your deck or patio—remembering the full sunlight requirement. I’ve seen some great plantings of geraniums that were a series of several plants clustered together or planted into short rows bordering flowerbeds that were filled with plants of contrasting textures and colors. You can keep your geraniums looking neater and producing maximum blooms if you will “deadhead” the fading blossoms throughout the growing and flowering period. Do this by breaking off the flower stem at the natural “joint” where it connects to the plant stem. These should snap off easily from the stem as the blossom head begins to brown. If you want to produce more geranium plants from the ones you already have, just take some cuttings (3 or 4 inches long) from your healthy actively growing plants and allow them to root in some moist sand or vermiculite. Transplant into separate pots of good potting soil after a few weeks, when roots have developed on the geranium cuttings. If you have some brightly lighted windows (remember that full sun! ), you can keep potted geraniums blooming indoors all year-round. Or, you can save plants from your outdoor garden through the colder winter months by digging them up in the fall, allowing them to dry out, and hanging them in the garage until planting time arrives again in the spring. I saved some geraniums one year by burying them (accidentally!) in a pile of leaves throughout the winter. Next spring, they started greening up, so I rescued them and planted them into the garden, where they went right back to the business of blooming! 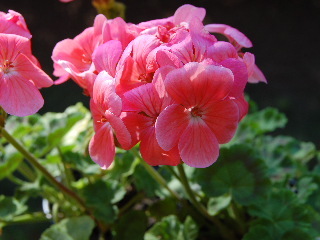 Geraniums come in a variety of colors including red, pink, salmon, white, and lavender. A full season of blooms with just a minimum of effort—my kind of plant!